Richard Davis Bramston was born on 7 September 1871 at Eldorado Victoria, son of George Andrew Bramston and his wife Alice Elizabeth Maud Bramston (née Banon). Richard married Cecilia McGrade in Sydney on 2 October 1893. They had eight children including one daughter who died in infancy. Richard Bramston died on 1 August 1939 at St George District Hospital, Kogarah. He is buried with his wife at Woronora Cemetery, Sutherland. One of his brothers, William Bramston, was an alderman on Waterloo Council. Richard’s son, George Bramston, was an alderman on Canterbury City Council. Richard Bramston was an engineering blacksmith. When he died, he was remembered as one of the ‘oldest and most active supporters of the Labor Party’. 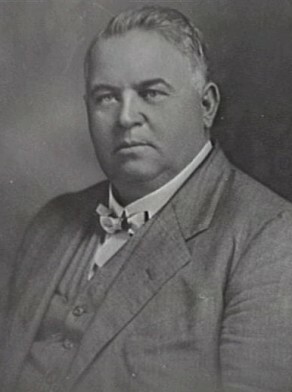 He was President of the Arncliffe Branch of the Lang Labor Party and a vocal member of the Australian Workers Union. Richard Bramston was Alderman for Belmore, 14 November 1917 to 30 November 1924. He replaced Denis Guihen who died 31 October 1917. Bramston was a member of the Health and By-Laws Committee, 1917-18, the Electric Lighting Committee, 1918-19, the Works Committee, 1919-21 and 1923-24, and Finance Committee, 1920-21 and 1923-24. Information on Richard Bramston and the Bramston family courtesy of Valerie Wotton.